At the top of “Witch Perfect,” Macy decides to drop a bomb on her sisters. Last episode, she learned from DNA testing results that she and Maggie are fully related and have the same father and that Maggie and Mel are actually the half-sisters. It’s a huge shakeup, and to Charmed’s credit, the reveal is treated as a very big deal. The episode allows room for Maggie and Mel to feel everything that they’re feeling, to tumble through a mess of emotions brought on by genuinely life-altering news. It isn’t just treated like a story twist; there’s emotional weight to it. Macy tells them in a truly terrible way. She’s nervous, and they encourage her to just spit it out, so she does. She spits out that everything they have ever known about each other and their parents is a complete lie. And Mel and Maggie are rightfully distraught. Charmed can still sometimes seem unsure of itself and what tone it’s trying to strike, its sense of camp and self-awareness fluctuating scene-to-scene. But one area where it manages to be consistent is when it comes to the sisterhood and the pathos of these characters. All of their reactions and processing of this information is drawn from character development done throughout the season. Mel’s pissed almost immediately. She tends to be the most reactive of the three, and she immediately freaks out at Macy. Because yeah! That was a weird way to tell two lifelong sisters that they’re actually half-sisters and that their mother lied to them their whole lives. Maggie, the more sensitive and introspective but also most empathetic of the three, is instantly hurt but doesn’t lash out at Macy. She processes much of her feelings internally, doesn’t want Mel to speak for her, isn’t quite sure what to do with the bomb that has fallen on her lap. Sarah Jeffery has proven to be a very strong emotional core for this show. She has to look weepy throughout this episode, and she does it very well, holding onto sadness in a visceral way. She hasn’t quite come for fellow CW actor Gina Rodriguez’s crown as the Best Crier On Television, but she’s close. On that note, Rodriguez actually directed this episode, and her direction is solid throughout but stands out in the show’s more grounded moments rather than the visual effects-heavy magical parts. Even Macy’s truly baffling delivery method when it comes to this news makes sense for who she is and what she has been through. Macy tends to be a bit detached from her emotions and the emotions of others, leading to a certain social ineptitude that has caused some tension with her more readily forthcoming sisters in the past. “Our lives are not data that you can arrange so that it makes sense,” Mel throws at Macy. She does indeed deliver the information as if it’s just data sets, just DNA code and not really complicated, life-changing info. But her excitement about these results also underscores her own experiences. She’s excited by the idea that she’s closer with Maggie than previously thought. She’s excited to get closer to having some more answers about their mother. Macy has already lived through the game-changing news of learning she had sisters she never knew about and finding out who her mother was, so she’s a little more conditioned to receive more huge news than the other girls are. In some ways, Charmed’s human conflicts are far more compelling than its magical ones, which is both a blessing and a curse. The big character-driven scenes work well and come to life with authenticity, gravity, depth. In addition to the sisterhood tension in this episode, there are also some really sweet scenes between Mel and Jada. Their relationship is moving fast, but it feels believable so far. Hurt by all the ways her mother lied to her, Mel decides to be forthcoming with Jada, which means both telling her the truth about why she joined the Sarcana in the first place and also telling her about Neko, who has resurfaced in Mel’s life because post-memory-wiping spell, she’s a now a private investigator who is looking into Jada on the behalf of Jada’s parents who think she joined a cult. Jada receives Mel’s honesty well, and the two continue to grow together with a share trust. The occasional corniness that seeps into these scenes depicting the show’s more human storytelling is actually easier to swallow than some of the clichéd lines and visuals of the magical happenings. But that’s a problem for a show that literally hinges on a supernatural premise. Tonally, the show is often all over the place. 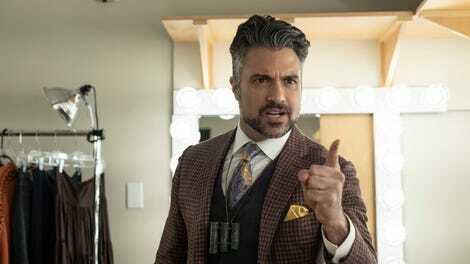 Jaime Camil is perfectly cast as a college a cappella director who has been possessed by “the maestro,” essentially the conductor behind sirens, the creatures from Greek mythology. There’s some fun camp and genuine creepiness to his scenes, and the overacting that happens is definitely intentional. But it’s difficult to assign any kind of stakes to this demon subplot, especially since the main life that’s threatened is a character that we meet for the first time in this episode. And the composer demon’s whole schtick doesn’t really fit thematically with the rest of the episode. The stakes don’t come until later, when the sisters can’t access the power of three because they’re still upset with each other. For more cohesive storytelling, there needs to be more of that overlap in the two sides of Charmed’s narrative, in the merging of reality with the supernatural. 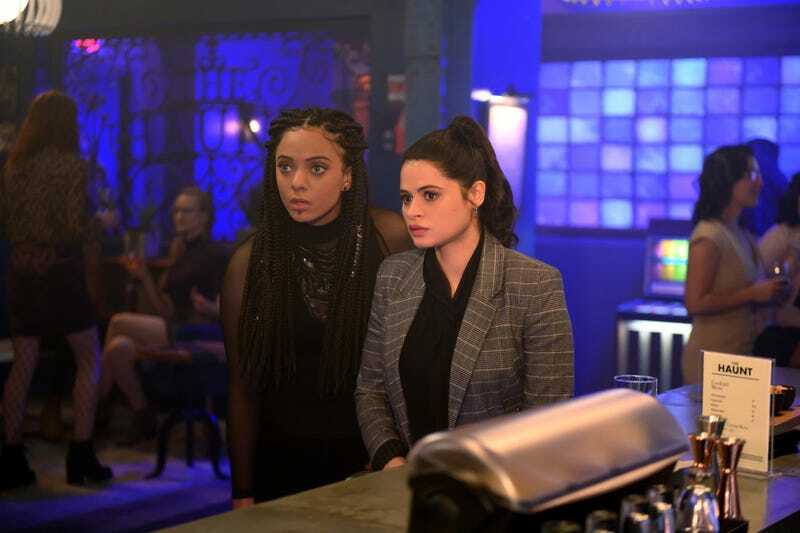 “Witch Perfect” zeroes in on a lot of the relationship dynamics and more grounded parts of the show, and the monster of the week is more of a peripheral plotline. That distribution works well, but the attempts to blend the storylines aren’t seamless, yielding a resonant but scattered episode. Still, the episode’s focus on character and more long-term storytelling versus just rapidfire plotting is a welcome shift. Charmed doesn’t need to dial back the magic, but it should feel more like an integral part of the show’s emotional core than just like flashy, campy fun. “Yo, did I just vanquish my first demon? !” Galvin is growing on me. Harry can’t abandon the girls! Doesn’t he realize that they all have abandonment issues especially when it comes to father figures?! Jada growling during her spell on the serial sexual assaulter was a little much. Other than that, the scene is great.